I have lived in Texas since 1986. My husband is from McAllen in the Rio Grande Valley and through the years I have come to know that area. I enjoy the breezes, palm trees and the flatness of the land. I have also witnessed the change from an agricultural region with citrus orchards and fields of vegetables to an urban complex with vast residential subdivisions and typical chain stores and restaurants. This evolution began when NAFTA was approved 20 years ago. Then 9/11 happened. And with that, immigrants who lived in the U.S. with a green card or illegally had to be afraid of being scrutinized for illegal activity—even possibly terrorism. I lived in Texas with a green card from 1988 to 2012, at which time I became a U.S. citizen. I grew up in what was then West Germany. Its border with Eastern Germany was highly protected and most obvious when one had to travel through eastern Germany to visit Berlin. The Berlin Wall completely cut off West Berlin from East Berlin and surrounding East Germany. The wall which ran through the city from 1961 - 1989 had graffiti art all over it. "Pieces of the fallen wall became precious mementos as art to buy and possess. The border wall which divides the U.S. and Mexico varies from a 15-foot-high corrugated steel and concrete fence to a chain-link fence with railroad ties. Presently, it " covers only 700 miles of the proposed 2,000 miles border. When the partial border wall was built, memories of my home country's border division surfaced, a barrier which divided a former united country where people spoke the same language. I had to go down to the Valley to see what was done and how it impacted life on both sides of the border. We were accustomed to going over to the Mexican town of Reynosa to shop or eat. That is now a security risk and not being done easily anymore. This hurts the economy in those border towns which rely on the heavy traffic by tourists. Conversely, people from northern Mexico would come across the border into the U.S. to work. People who have lived for generations in this flow of coming and going are now afraid to do so. 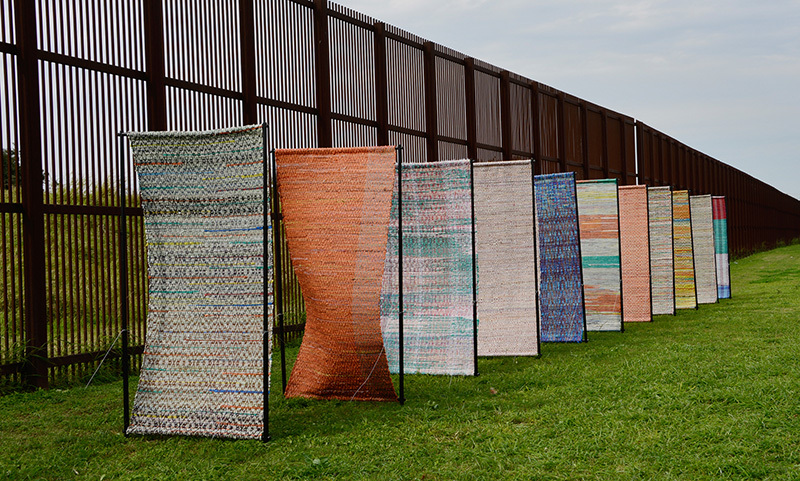 My installation, Checkpoint Carlos consist of 11 panels standing vertically in close proximity to the borderwall. They form 10 passageways, 8 feet tall and 4 feet wide. Each panel is made of handwoven material. The warp consist of colorful cotton thread. The weft is made up of densely beaten plastic bags, recycled from the plastic wrappers of various newspapers. These bags come in many colors, from very soft neutral to strong orange and turquoise colors with some writing on them. They will last well through many years outside and can withstand sun, rain and wind without fading or ripping.The pattern woven into the pieces will be old traditional overshot weaving, providing a nice texture to flat surfaces. Plastic bags from newspapers symbolize what newspapers give us: a connection to global events as much as to local happenings in our community. These bags are given to me by a vast variety of people of whom I know only a few. Even though the people who will see the installation will never meet the people who provided the materials, they are creating a community. One part would not be possible without the other. I am using old traditional overshot patterns which give an assurance of familiarity and a connection to our history. All who will see this installation will respond in their own way. But I hope that people will connect emotionally to the pieces and believe in our continued humanity which shows that we have more in common than what separates us.